GAME-INDEX:Beautifully-designed applications that make your life more fun! With five different levels ranging from easy to very difficult, Maze Mania is good for hours and hours of amusement. Yet this classic-design game is not only great fun to play–it’s literally a piece of art for your i-Pad. The highly realistic look makes you feel like you’re in the maze yourself. It’s addictive! To play, tilt your i-Pad left and right and up and down to move the ball toward the goal. This game is harder than it looks: it takes a lot of concentration to get to the end without falling in! Once you clear one level, you’re automatically moved on to the next. Or you can select your level by clicking on the buttons numbered 1-5 in the top left corner. 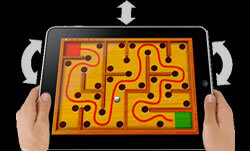 For kids, Mazes Mania improves concentration, while for adults it’s a great diversion when you need a break. But be careful: you might just forget to get back to work!Buy Now! Copyright © GAME-INDEX.net Co., Ltd., All rights reserved.